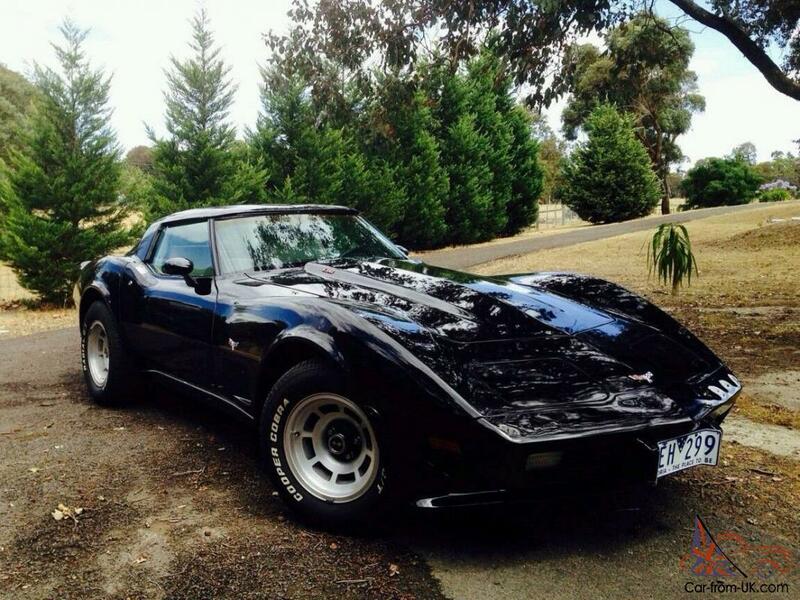 By the late 1970’s, Corvette production was moving at a pace that had never been seen in the history of the car. As Chevrolet General Manager, Robert Lund, had stated in March, 1977, “The St. Louis Plant is operating two nine-hour shifts daily and working overtime two Saturdays a month just to meet sales demand. 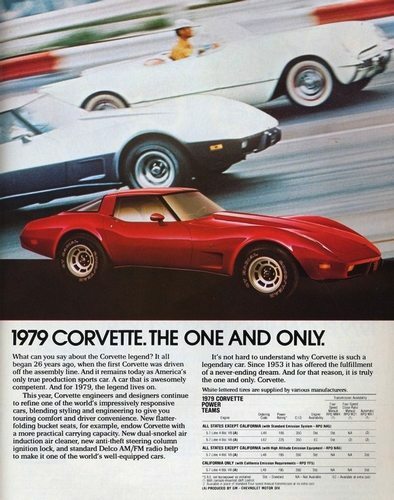 Current demand is running more than 29 percent ahead of last year.” Little did anyone realize that, after the popularity of the 1978 Pace Car and Silver Anniversary Editions in 1978, Corvette was about to set another production record – manufacturing more than 50,000 Corvettes in one year – with the 1979 model year. 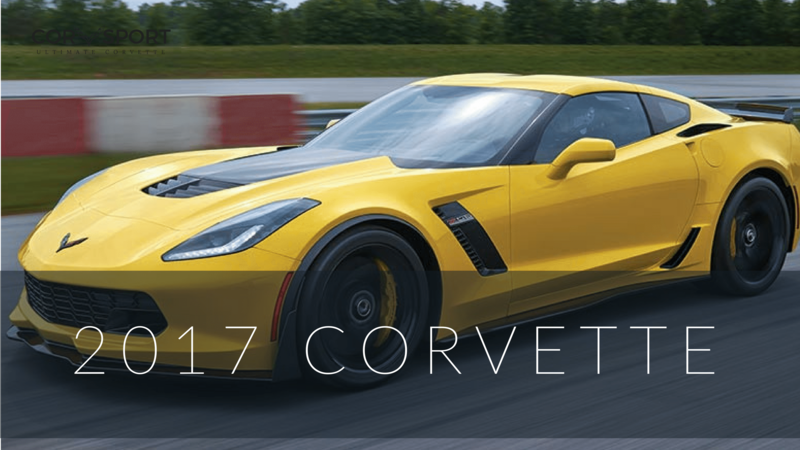 At the same time, Corvette was about to surpass another record – a base sales price of more than $10,000 – for the first time in the car’s history. 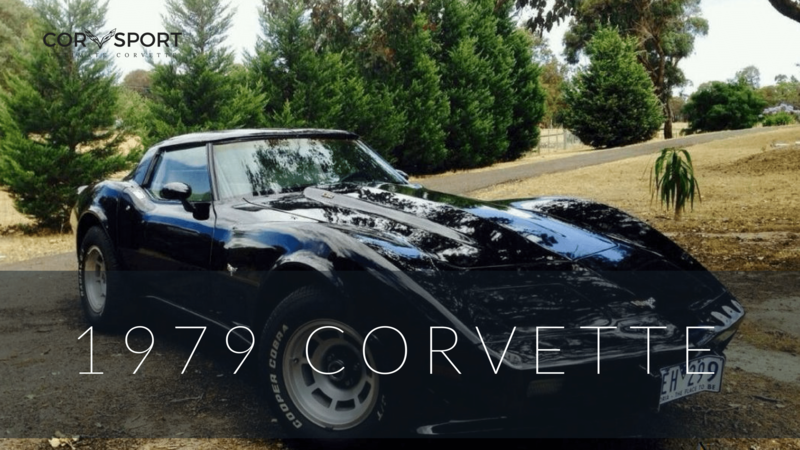 The price increase in the 1979 model year was well justified, especially given that the Corvette had been fast approaching that cost threshold for the past couple of years. As before, Chevrolet engineers had continued adding more of the previously optional features available to consumers to the standard base package. While in 1978, tilt-telescopic steering columns, air conditioning, and power windows had all been optional, nearly 80 percent of all the cars sold that year included all three of these options – which, when added up, cost consumers an additional $910.00 over the base price of $9,351.89. In early 1979, while these items remained optional for a time (now at a combined cost of $966.00,) it was that this trio of optional equipment become a standard part of the car. 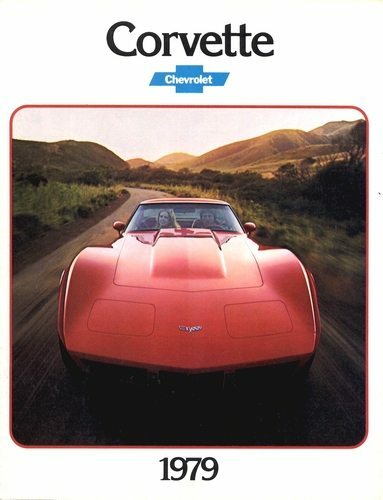 On May 7, 1979, they officially became part of the standard equipment group, and Corvette’s base price climbed to $10,220.23. By the end of the production year, the base price would soar even higher as additional options – along with a strong inflationary spiral on the cost of some of the standard equipment – pushed the car’s base price north of $12,000.00. 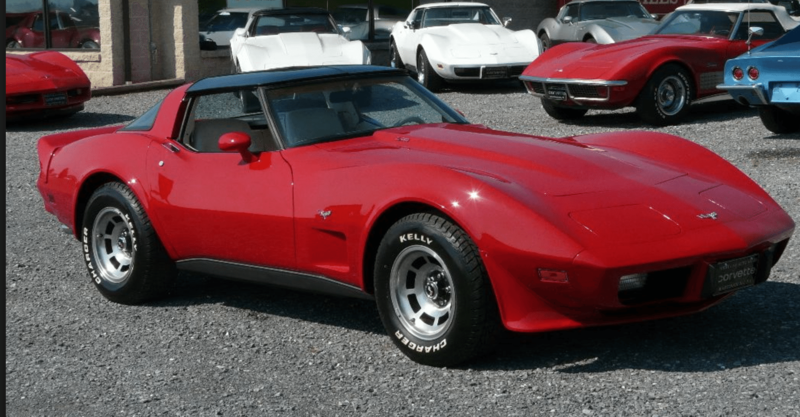 While the fastback Corvette design introduced in 1978 carried over into the 1979 model year, there were a few, mostly subtle, refinements made to the car’s overall appearance. 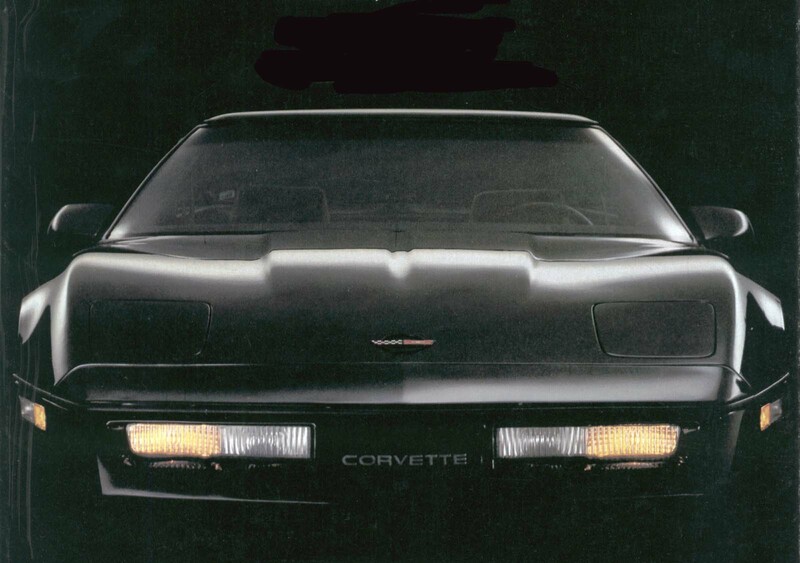 For one, the “25th Anniversary” emblems were replaced by the more traditional “crossed flags” which had been a key identifier of the Chevy Corvette for more than a quarter century. The moldings around the rear window and glass T-top panels (not shown) was changed from a chrome finish to black. Additionally, the chrome trim that wrapped the 1978 rear window and the roof panels was replaced with black trim moldings. Tungsten-halogen headlights were phased into 1979 production early in the model year for increased visibility. The tungsten-halogen headlight beams replaced only the high-beam units. Lastly, a couple of items the 1978 Pace Car Package became options for the 1979 model year. Tinted roof panels (RPO CC1) became available to consumers, as did the front and rear spoilers (RPO D80). The spoilers were functional, decreasing drag by about 15% and increasing fuel economy by about a half-mile per gallon. 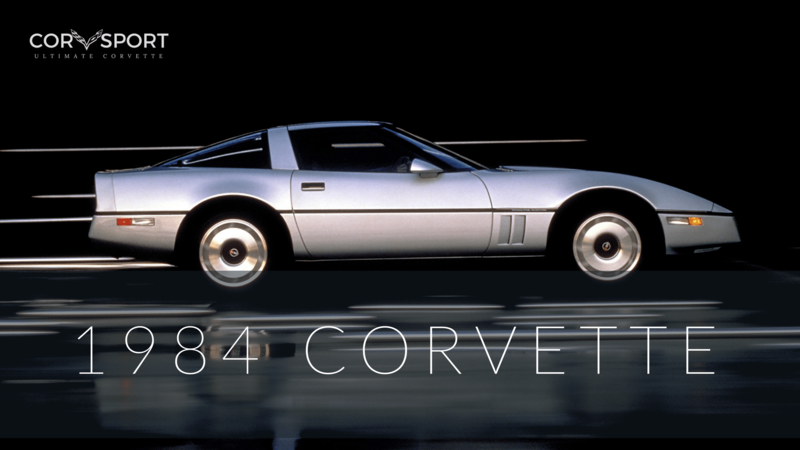 Despite this, sales of Corvettes with this option in 1979 accounted for just under 13% of total sales that year. Moving inward, the interior received slightly more refinement than the exterior. The biggest, most notable change centered around the introduction of the new “high back” seat style previously introduced on the 1978 Pace Car Replicas. These same seats were now standard equipment for the 1979 model year. The seats used an extensive amount of plastic in their frame structure which resulted in an overall weight reduction of about twelve pounds per seat. 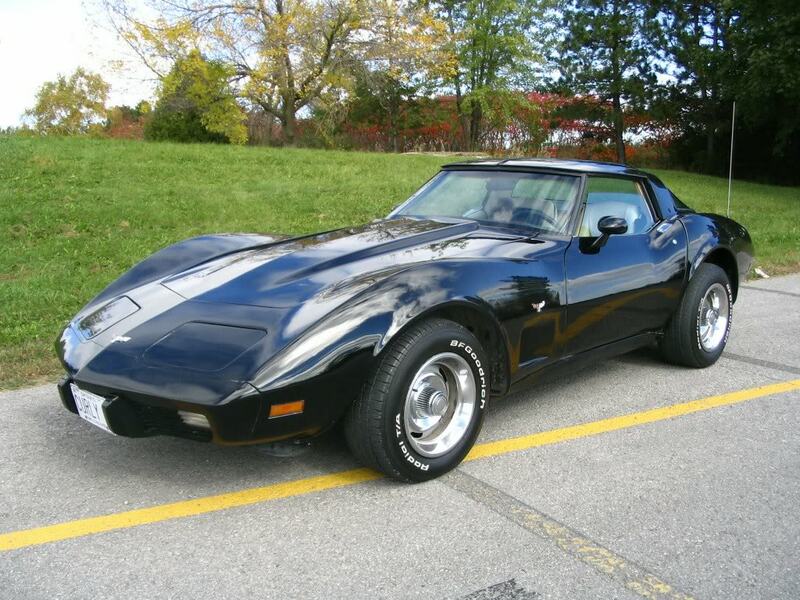 DID YOU KNOW: The 1979 Corvette was the first model year to offer an AM/FM Radio as standard equipment. 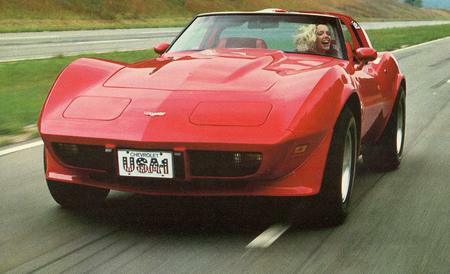 Prior to 1979, if a Corvette owner wanted to include a radio, they ordered it at an additional cost to the base price. 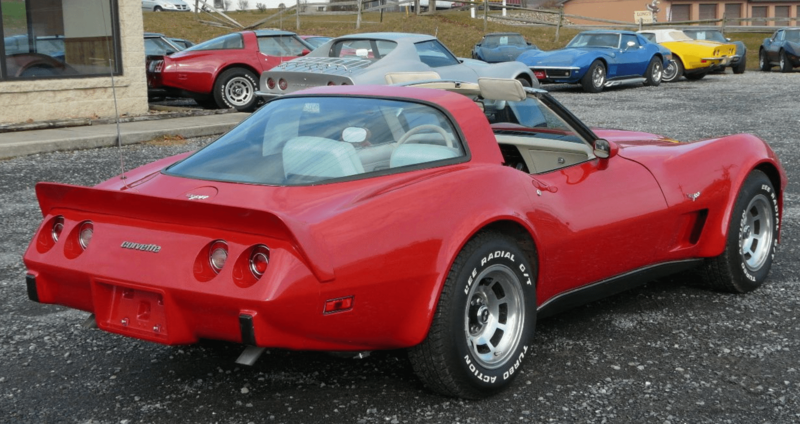 The 1979 Corvette featured the same high-back seats (standard) that were previously featured only in the 1978 Indy Pace Car Replica. At the same time, the new seats offered improved side bolster support to its occupants. They also featured seat backs that folded at a higher point (than most conventional seats) to permit easier rear storage area access. Inertia introduced which restrained the seat backs during sudden deceleration, which negated the need for manual locks on these new, folding seats. Despite all this, the new seats did not offer reclining seatbacks, which were becoming increasingly available in most vehicles – even the cheapest Japanese cars being built that year. 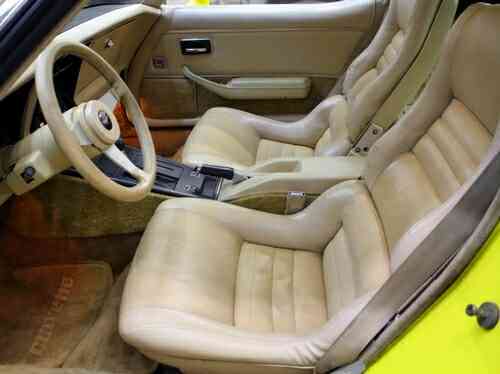 While the seats received a great deal of attention, the rest of the interior was subject to a number of other small changes as well. The driver and passenger seat tracks were redesigned to provide an additional inch of forward travel. The ignition cylinder lock received additional shielding to reinforce it, making it more difficult to access in the event of an attempted car theft. 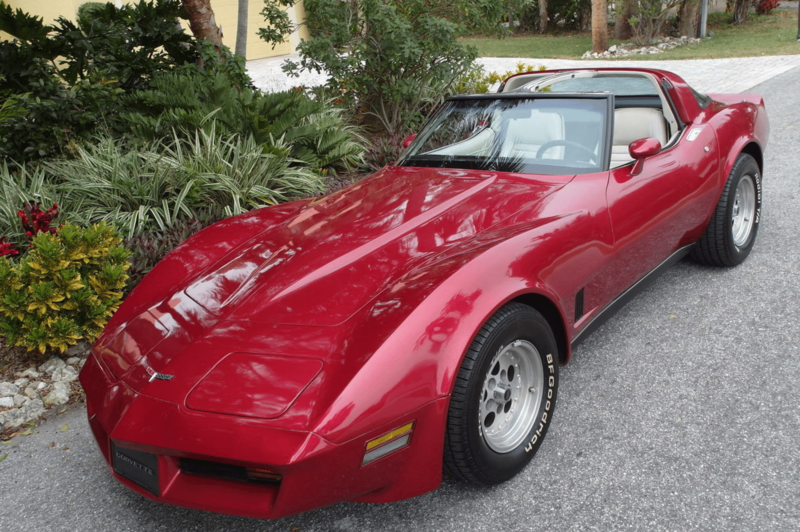 The previously optional AM-FM radio became standard equipment, while an illuminated visor-mirror combination for the passenger sunvisor became an available option on the 1979 Corvette. An 85 miles-per-hour (max.) 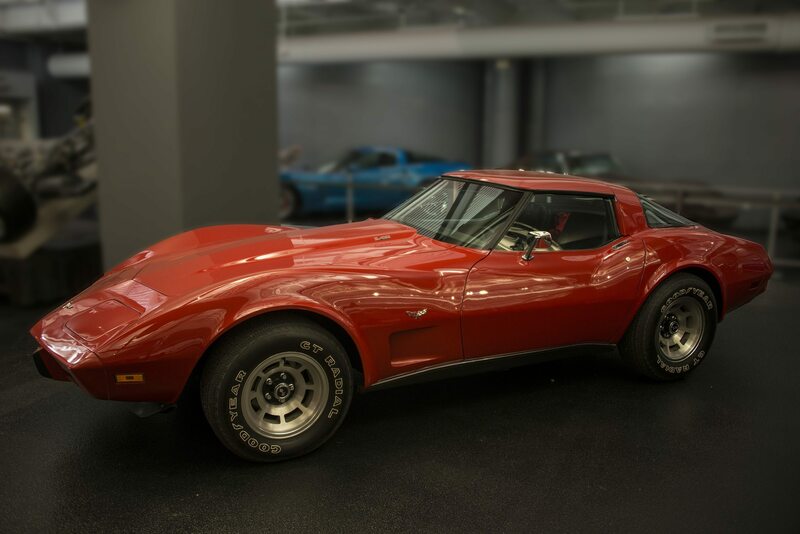 speedometer, which would be officially introduced as standard equipment in the 1980 Corvette, was installed on some late-production 1979 models. This last was the result of a Federal mandate that was slated to begin in September, 1979 and would remain in effect until March, 1982. Mechanically, both the base L48 and optional L82 engines received a 5 horsepower increase due to a new “open flow” muffler design. Additionally, the low restriction, dual snorkel air intake that had been introduced on the L82 engine was added to the L48 engine, which gave the base engine an additional 5 horsepower boost, resulting in an overall output of 195hp for the L48 and 225hp for the optional L82 engines, respectively. Elsewhere on the car, shock absorber rates were standardized so that they were the same, regardless of the type of transmission (manual or automatic) installed. On cars equipped with an automatic transmission, the final drive ratio was lowered from 3.08:1 to 3.55:1. The fuel filler pipe was redesigned to make it more difficult for consumers to modify for leaded-fuel access. 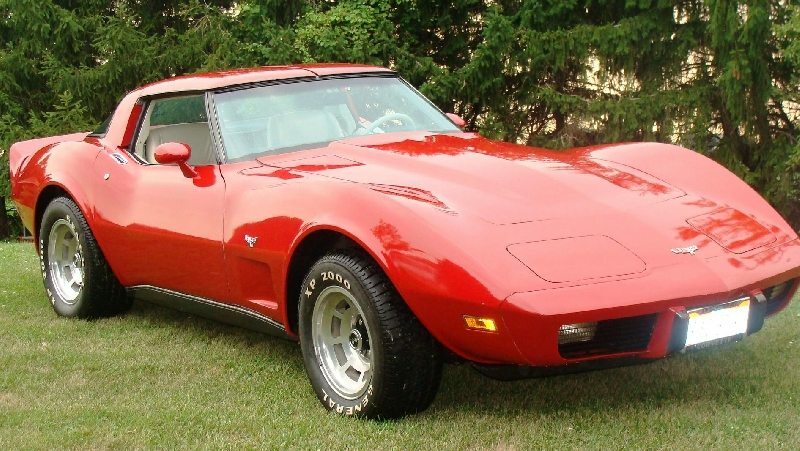 It was the height of the Corvette’s acceptance, which was ironic given that General Motors had once been convinced that the C3 model would never sell half as well. Instead, the car’s popularity was stronger than ever, despite an increasing number of competitors vying for consumer attention. It had proven to be indispensable as both a high-profit personal car as well as a showroom sweetheart. Automotive reviewers and critics remained skeptical of the car’s value given its steadily rising prices and the availability of comparatively priced sports cars like the Mazda RX-7 (with base pricing starting at just $6,395), the Datsun 280ZX ($9,899.00), and even the 1979 Porsche 924 ($12,025.00). Still, none could argue that the Corvette was still an impressive straight-line contender in this field of European and Asian imports. 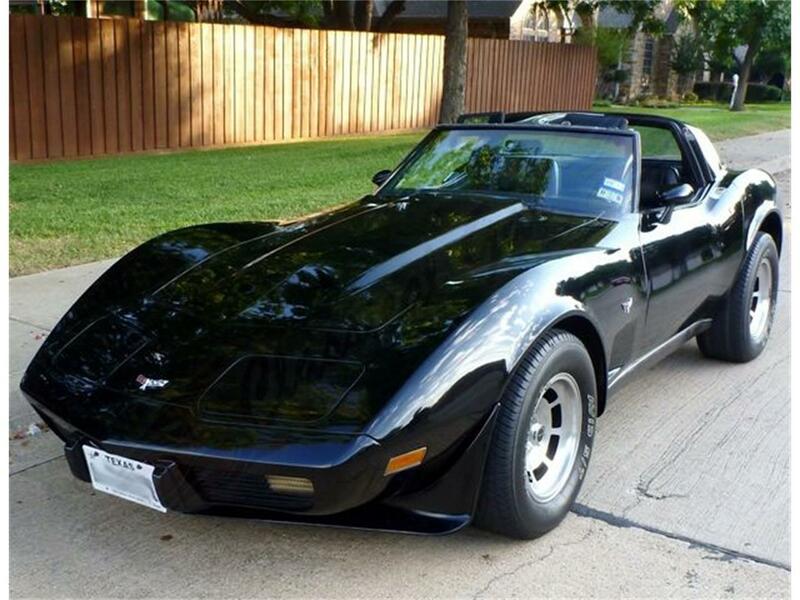 Road & Track Magazine test drove a 1979 Corvette equipped with an L82 engine and recorded a 0-60 time of just 6.6 seconds, a standing quarter-mile time of 15.3 seconds at 95 mph, and a top speed of 127 mph. 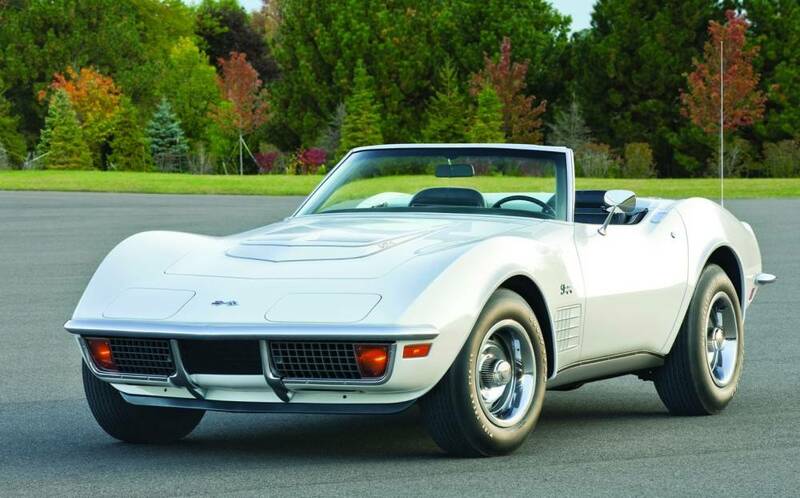 Still, most critics agreed that the C3 was again getting “long in the tooth” and, while the prestige of owning a Corvette continued to flourish amongst consumers, serious automobile enthusiasts were beginning to question how much longer it would be before Chevrolet introduced the “next generation” of the beloved sports car. 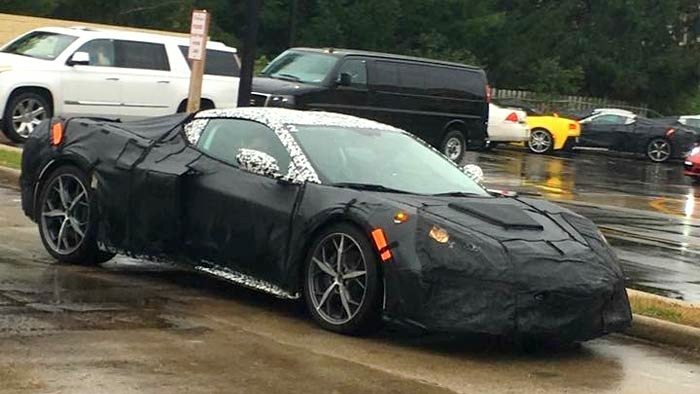 With more than a half decade to go before the actual arrival of the C4, the speculation would continue, though the engineers behind Corvette still had a few tricks up their sleeves, as would be seen in the coming years as the production of the third-generation “Shark” started to draw to a close. ROCHESTER Q-jet #17059507: 350 C.I., 195HP, AUTOMATIC., AIR COND. CALIF.
Powerplant Mount Locations: 2 front and 1 rear, compression type. 2 front and 1 rear, compression type. – Type Dual, 4 port, exhaust emission to a single runner with center takedown collector. Dual, 4 port, exhaust emission to a single runner with center takedown collector. Type: Automatic hydraulic torque converter with compound planetary gear system – three forward speeds and reverse. All welded, full length, ladder constructed frame with five (5) cross-members. Side rails and intermediate cross-members box section; front crossmember box girder section. Eight (8) body mounting points. Independent, SLA type, coil springs with center mounted shock absorbers, spherical joint steering knuckle pivots. Fixed differential housing hypoid ring and pinion gear set, tubular articulating inner axle shafts and short solid outer shafts with integral drive flange, independently sprung rear wheels. Full independent with frame-anchored differential. Position of each wheel established by 3 links; tubular axle drive shafts, transverse strut rods,and torque control arms. Vertical suspension loads taken by transverse leaf spring. Built-in camber adjustment at strut rod inner ends. Brake Type: Disc Front and Rear; Power Assist Std. System: 4-wheel caliper disc brake dual hydraulic system with pressure differential and warning light. -Type: Double faced disc spaced by integrally cast radial cooling passages. – Diameter and Width: 11.75 in. x 1.25 in. – Method of Attachment: Riveted. – Type: Drums; inboard of disc rotors on axle shafts. Internal expanding shoes, mechanically actuated. – Control: Lever; floor mounted between bucket seats. – Wheel Type: 4-Spoke with center horn button. – Diameter: 14.75 in. x 14.25 in. – Type: Integral, recirculating ball nut with hydraulic pressure provided from a vane type pump. – Attachment to Hub: 5 hex nuts, 7/16-20 UNF 2-B, arranged on a 4.75 dia. bolt circle. 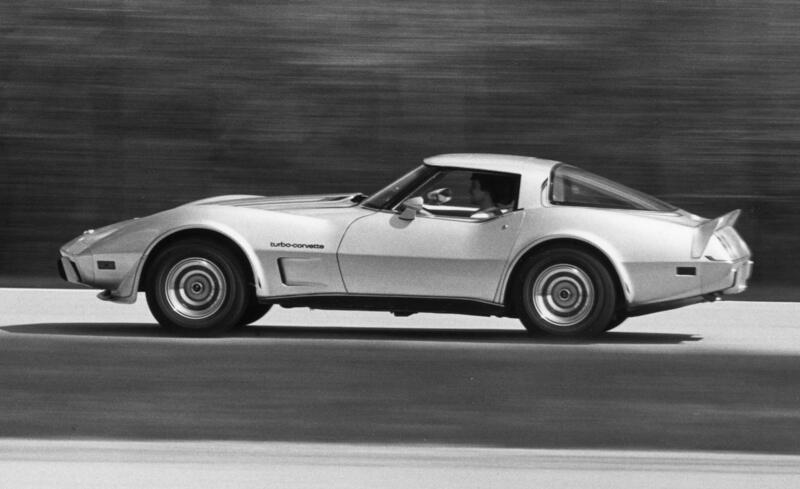 The last six digits for the Corvette Coupe begin at 400001 and run thru 453807, accounting for all 53,807 Corvette Coupes built in 1979. 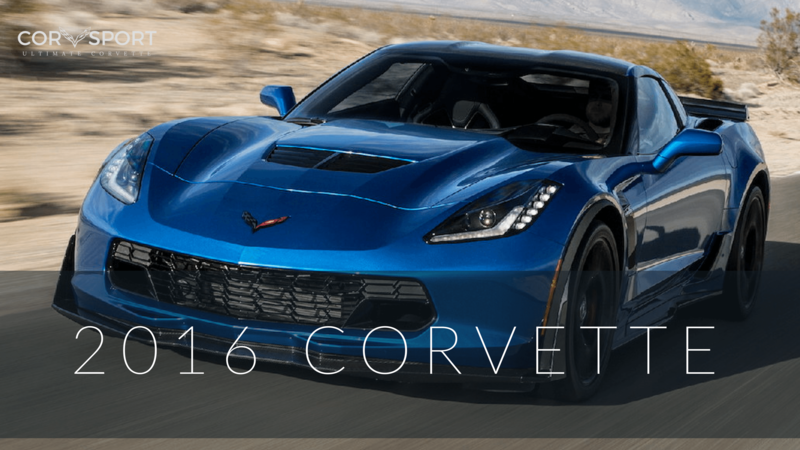 5,227 Corvettes were sold in Canada. Each Vehicle Identification Number (VIN) is unique to an individual car. 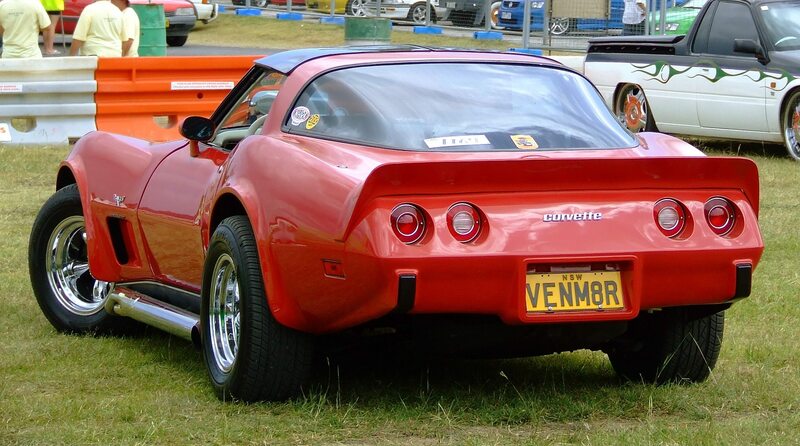 For all 1979 Corvettes, the location of the Vehicle Identification Number (VIN) is stamped on a plate attached to the left front body hinge pillar. 1210 – Date Code. Month and Day. 1210 – December 10. ZAA – Type Designation. ZAA – 350ci 195hp, 4-speed manual transmission. 3-Speed Automatic – Name plate tag on right-hand side of case above filler plug. 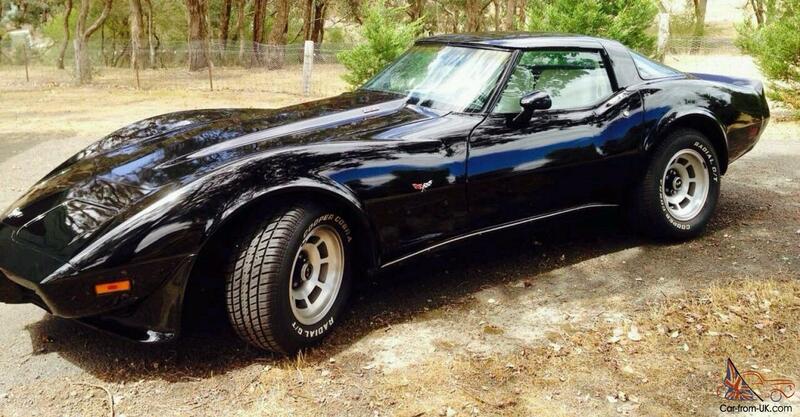 The base price of the 1979 Chevrolet Corvette Coupe without any optional equipment. A 350 cubic inch, 195 horsepower engine, 4-speed wide ratio manual transmission, leather or cloth/leather interior trim, and T-tops were included in the base price. Factory installed power door locks. Tinted glass lift-out roof panels. Requires UA1 Heavy Duty Battery when adding C60 Air Conditioning. Outside driver mirror assembly that included a mechanical linkage to control movement from inside the cockpit. Functional front and rear spoilers that decreased drag by 15% and increased fuel economy by about a half-mile per gallon. Not available with Trailer Package ZN1. Not available with Gymkhana Suspension FE7. In 1979, these included: 3.36 (Code OM), 3.55 (Code OH), 3.70 (Code OJ). Cruise control allowed the car to maintain a set speed without the driver depressing the accelerator pedal. The cruise control option was only available with MX1 automatic transmission. Not available in states Florida, Maryland, Oregon, and Washington. Not available in Boston, Massachusetts; Chicago, Illinois; Des Plaines, Illinois; Grand Rapids, Michigan. Not available in the county of Cook, Illinois. A close ratio version of the MM4 4-speed manual transmission. The gear ratios for the RPO M21 Close Ratio 4-Speed Manual Transmission are: 1st Gear – 2.43:1, 2nd Gear – 1.61:1, 3rd Gear – 1.23:1, 4th Gear – 1.0:1 (Direct). The Automatic Transmission consisted of a 3-element hydraulic torque converter and compound planetary gear set. It was equipped with the following gear ratios: 1st Gear – 2.52:1, 2nd Gear – 1.52:1, and 3rd Gear – 1.00:1. MX1 was a no-cost option. Manual transmission was not available when choosing NA6. L82 was not available when choosing NA6. Includes color-keyed leather-wrapped Sport Steering Wheel. Optional size tires with special raised white lettering. Heavy Duty Battery (UA1) – Optional, heavier-duty battery with increased cranking amps/capability. Required with combination C49 Rear Window Defogger and C60 Air Conditioning. The standard/stock radio equipped with an 8-Track Tape Player. The standard/stock radio equipped with a Cassette Tape Player. The standard/stock dealer installed radio equipped with a CB. Full 40-channel Citizens Band radio. CB mike is stowed on the center console. 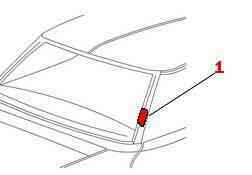 A rear deck antenna that retracts and extends when the radio or ignition is powered off and on respectively. The power antenna extends 31 inches. Requires UM2, UN3, UP6, or U58. Manual transmission was not available when choosing YF5. L82 was not available when choosing YF5. Factory installed power windows and factory installed power door locks. 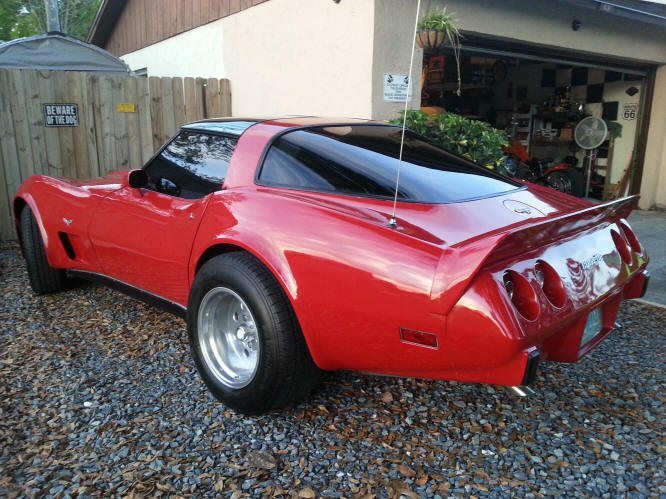 A group of convenience options available to consumers when purchasing a 1979 Corvette. The ZX2 Convenience Group included dome light delay, interior courtesy lights delay, headlight warning buzzer, underhood light, low fuel warning light, floor mats, intermittent windshield wipers and and passenger side visor mirror. High-back bucket seats introduced on the 1978 Pace Car replica became standard in 1979. 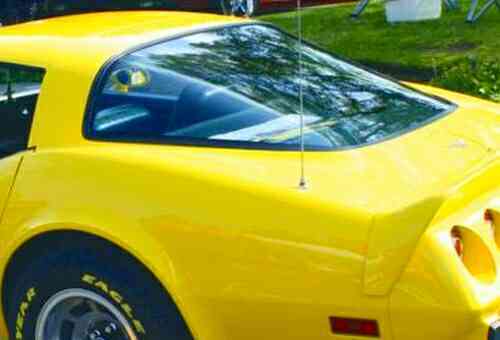 Front and rear spoilers found on the 1978 Pace Car replica became optional equipment (RPO D80) in 1979. 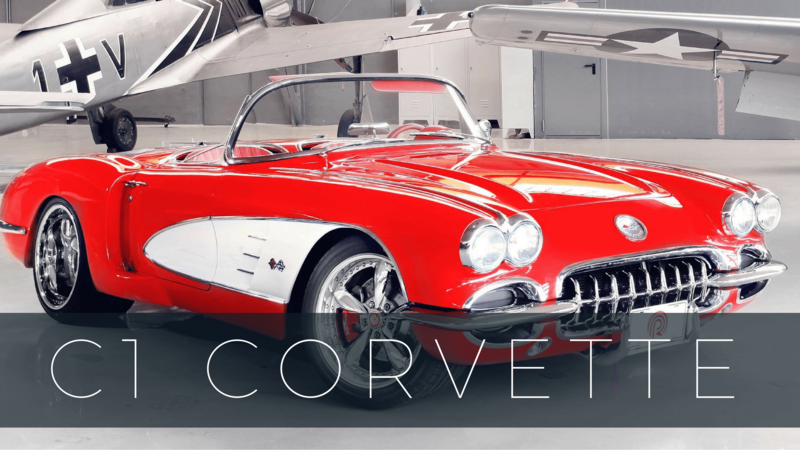 Manual transmission Corvettes now have the same shock absorbers as Corvettes equipped with automatic transmissions for a more comfortable ride. 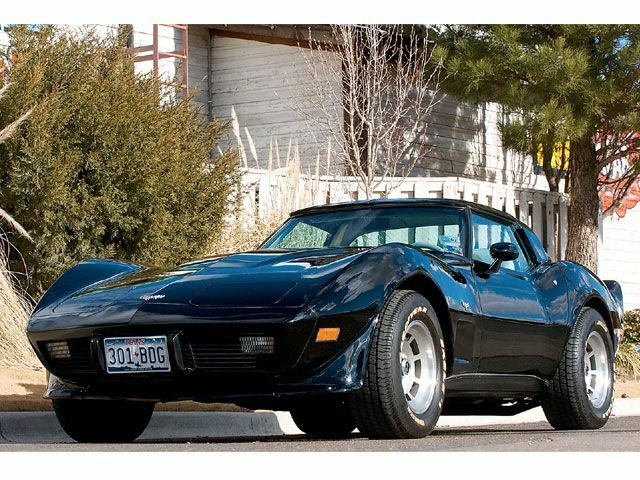 1979 models equipped with the automatic transmission come standard with a 3:55:1 rear axle ration versus the 3.08 from the previous model year for better performance. The L82 engine gets dual snorkel intakes for the air cleaner for a larger volume of air intake into the engine resulting in increased horsepower and torque. Also aiding in engine output is is a larger diameter “Y” pipe behind the emission converter and new open flow mufflers to reduce exhaust back pressure. Cold engine operation is improved with the trapped vacuum spark advance system and driveability is enhance with a new exhaust gas recirculation (EGR) system. AM/FM Stereo is now standard equipment. High beam headlights were replaced early in production with high intensity tungsten-halogen for increased visibility. Idle mixture screws have been preset at the factory and capped. Do not remove the caps during normal engine maintenance. Idle mixture should be adjusted only in the case of major carburetor overhaul, throttle body replacement or high idle CO level as determined by inspection. Disconnect the distributor spark advance hose and plug the vacuum source opening. Start engine and run at idle speed. Aim timing light at timing tab. The markings on the tabs are in two degree increments (the greatest number of markings on the “A” side of the “Q”). The “O” marking is TDC (Top Dead Center) and the BTDC settings fall on the “A” (advance) side of the “O”. Adjust the timing by loosening the distributor clamp and rotating the distributor body as required, then tighten the clamp, and recheck timing. Stop engine and remove timing light and reconnect the spark advance hose. Raise the vehicle and remove the rear wheels. Loosen the equalizer check nuts until the levers move freely to the “off” position with slack in the cables. Turn the disc until the adjusting screw is visible through the hole in the disc. Insert a screwdriver and tighten the adjusting screw by moving the screwdriver handle upward. Adjust both sides. Tighten until the disc will not move, then back off six to eight notches. Install the wheels and place the brake handle in the applied position – 13 notches. Tighten the check nuts until an 80 pound pull is required to pull the handle into the fourteenth notch. Torque the check nuts to 70in. lbs. With the hand brake off, there should be no dragon either of the rear wheels. The car should be standing on level ground and the oil level checked with the dipstick. Withdraw the dipstick, wipe it with a clean rag, replace and withdraw again. The mark made by the oil on the lower end of the dipstick will indicate the oil level. If necessary, oil should be added through the filler cap. Never let the oil level fall so low that it does not show at all on the dipstick. If in doubt, it is better to have a bit too much oil than too little. Never mix oils of different brands, the additives may not be compatible. Crankcase Capacities: 327 & 350 Engines – 4 quarts, 427 & 454 Engines – 5 quarts. When changing oil filter, add one additional quart. 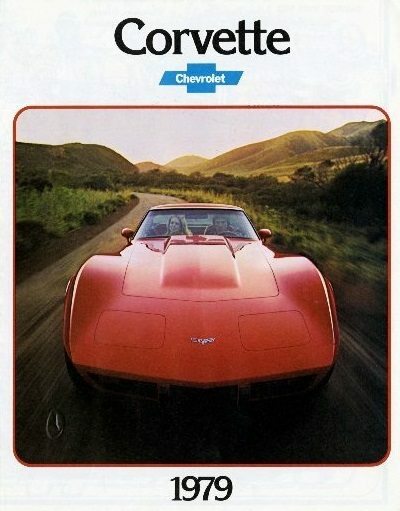 Download this 1979 Corvette Dealers Sales Brochure for a quick look at the features of the car.